There have been many posts here about flying machines but not so many about Beer. 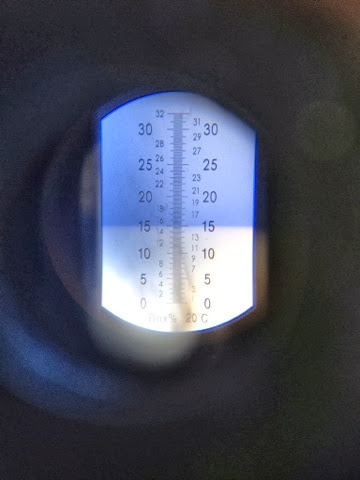 We brewed this morning, and I figured it was high time to document some of this process. 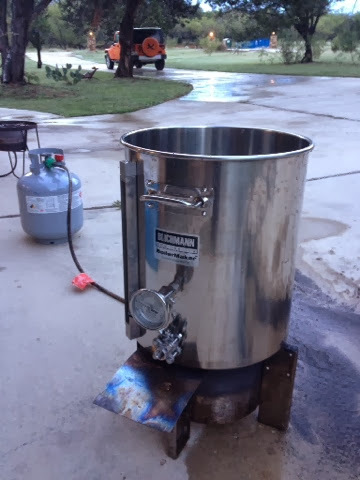 Here we go; this is how we brew! 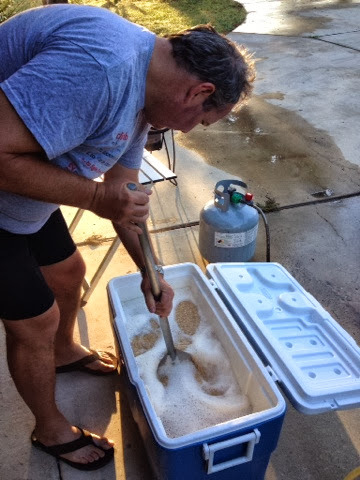 Today, we are making Race Pace Pale Ale, a new recipe by Alan, destined to be consumed by thirsty Air Racers in a month or so's time. First up, bring some water up to 170F in a big pot. That's a 75000ish BTU burner underneath the pot, so it doesn't take too long. The metal plate sticking out is to protect the thermometer on the front from direct heat. 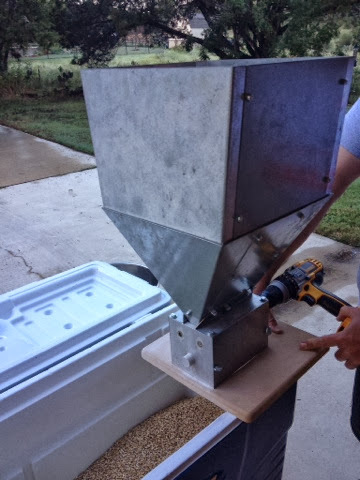 Measure out your grain. We are using mainly organic 2-row with some Cara pils and Crystal malt. Ignore the numbers on the scale, this was an action shot. 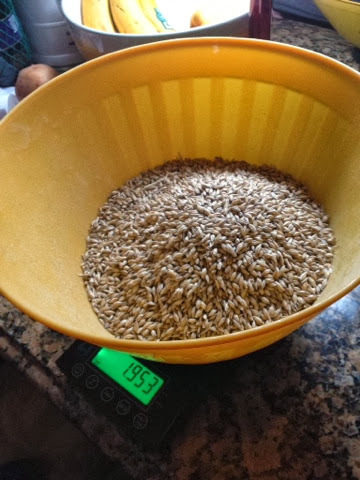 24 pounds of grain went into this beer. 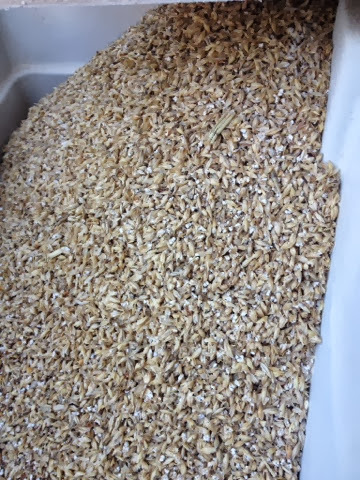 The grain goes into the mash tun, which is a converted cooler. Alan installed these mesh pipes inside, which filter out the wort from the grain when we pour it off, from the tap in the front. The grain goes in through a milling machine, powered by a drill to turn the rollers. Now it is all pulverized and ready for hot water addition. The water (hot liquor) is ready to go, at 170F. See the tap at the bottom here? 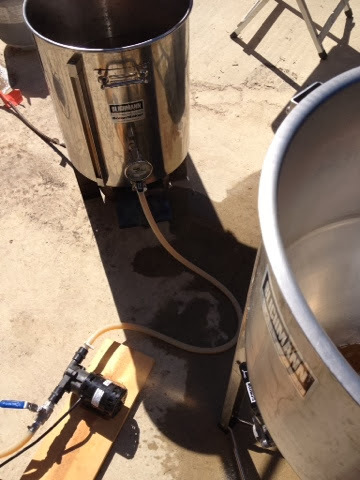 We connect a hose to that and pump the liquor into the mash tun. Alan adds some Burton salt and phosphoric acid to treat the water. 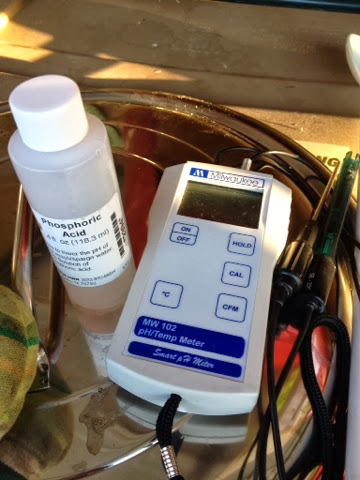 It needs to be around pH 5.4-5.6 for proper brewing. We have quite calcified water around here which is alkaline, hence the acidification. The Burton salt gives the water characteristics of that found in the British town of Burton, which is said to have the best water in all of the UK for brewing. Here, Alan is stirring the mash. He gives it a good mixing and then it sits for an hour, to extract all the sugary goodness from the grain. We place a sheet of tin foil with holes in, on top of the mash, which is to vorlauf the mash. This means basically pouring some off into a jug, which you pour over the tin foil, to recirculate the wort and encourage the grain bed to do the filtering. You can see the wort in the jug here is pretty cloudy and opaque; it becomes clearer after several pourings. It means you get less crud in your beer. 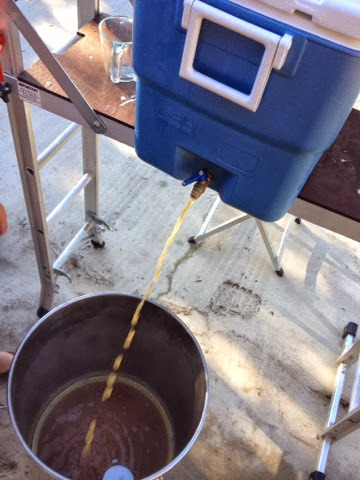 We pour the wort from the mash tun into the boil pot. The little silver cylinder half-visible at the bottom there is a HopBlocker, which is a filter that surrounds the tap, again to prevent crud from finding its way through the brew process. In this case, hops - they do not dissolve, they give their flavor and then need to be stopped from clogging up the system. This instrument is a refractometer. It tells you sugar content, from which you can work out the specific gravity of a liquid. You deposit a drop of the liquid by pipette, between the Perspex cover and the body of the instrument, then look through it like an eyeglass. This was taken at first run off, I.e. the first bit of wort to be run into the boil pot. It says we are at 15 Brix. We repeat the addition of water to the grain once more. It stays in the mash tun for only 10-15 minutes this time, not a whole hour. Meanwhile, we get the first half heated towards a boil, then add the rest once it is ready. Eventually the whole lot reaches boiling point. 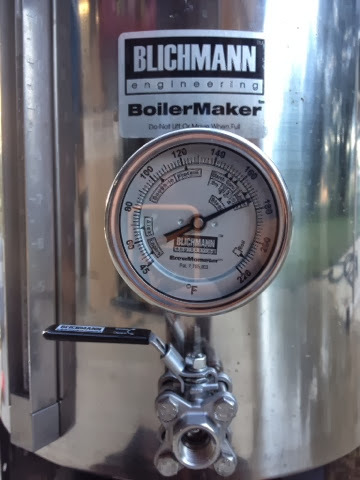 Here you can see the boil pot contains 14 gallons of wort in the gauge on the left. 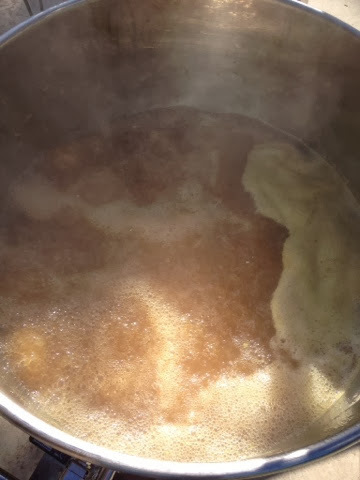 We get it to a nice rolling boil. This is where big pots come in handy. We used to do this in a smaller pot and it would always be in danger of boiling over. Here are some hops. They come as compressed pellets of hoppy goodness. 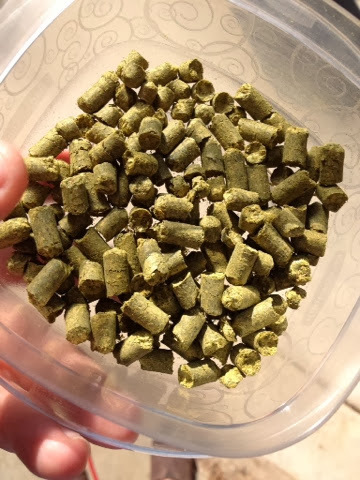 You can buy loose hop leaves as well, but the pellets are easier to work with and more frequently stocked in shops. The boil officially starts with the first hop addition. We add more at 45 and 55 minutes into the boil, and finish at one hour. Different hops give different characteristics to the beer. We are using Chinook and Cascade here. 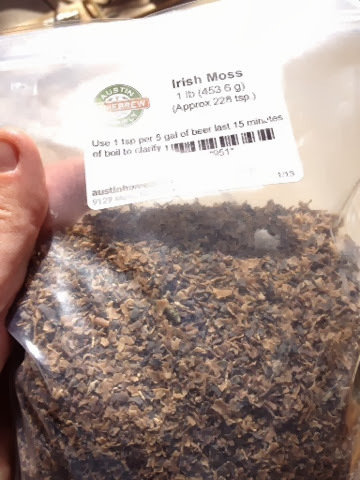 15 minutes before the end of the boil, we add some Irish moss. This is a clarification agent. 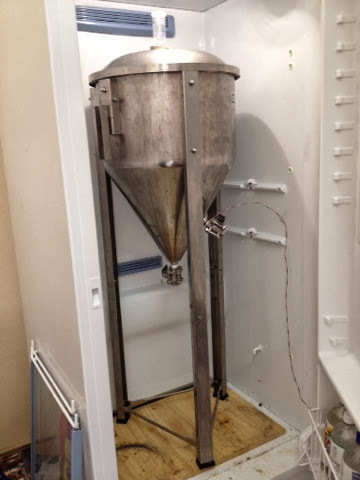 This magnificent piece of equipment is the Conical Fermenter, seen here without its lid. This will contain the beer during the fermentation process. We are about to take the wort from the boil pot and put it in here. This is a pre-chiller, i.e. 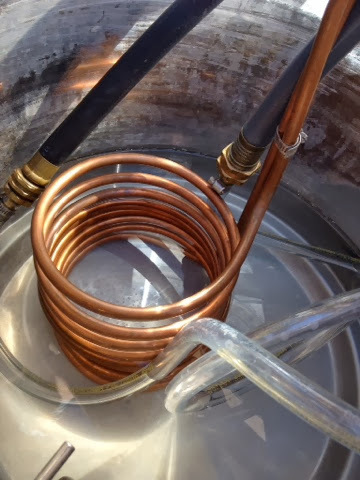 a heat exchanger coil sitting in a pot. It is about to get covered in ice water. It will cool the water used to help cool the wort in a moment, when we remove it from the boil pot. 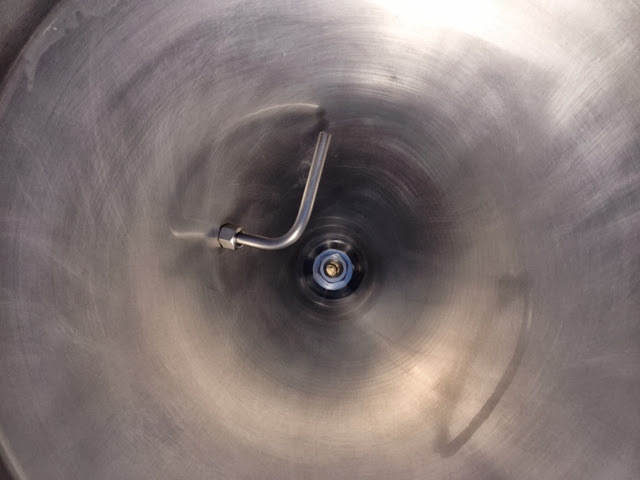 Look at this nice shiny interior of the conical fermenter! 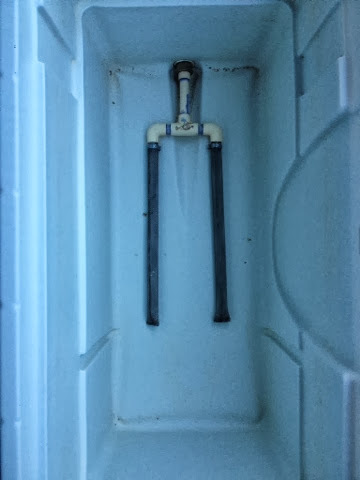 You can see the bottom tap in the middle, and the side tap takeoff. At this point, everything is sterilized. We start the transfer of the wort into the fermentation vessel. 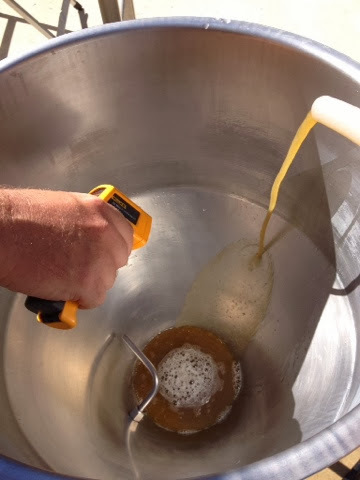 Alan is using an infrared thermometer to check the wort as it comes in. It has to come down from boiling (212F) to 79F or thereabouts. It cannot be too hot or the yeast will be killed when we add it. Here you can see some of the pipe work going on. ... another heat exchanger. The cream colored pipes contain proto-beer. The black pipes contain water. 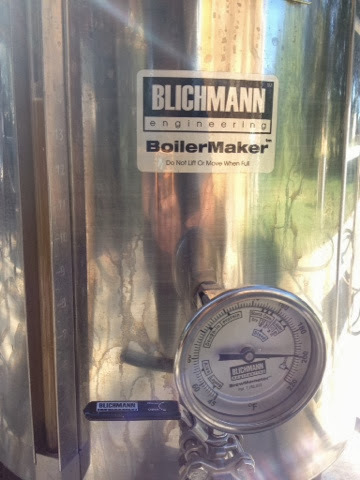 The water comes in from the pre-chiller heat exchanger you saw earlier, so it is already chilled, and then it goes through the brass plate chiller you can see in the bottom of the picture. 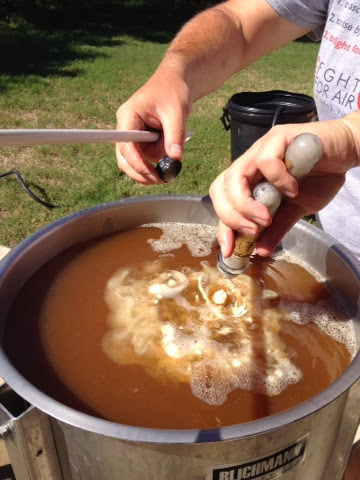 It is super efficient voodoo magic and drops the temperature of the wort like a stone. We collect the outgoing water in a large bucket and it is very warm when it comes out. Once the fermentation vessel is full, the last thing to do is to add the yeast. Yeast is magical stuff that makes beer and wine possible. It eats all the sugar and turns it to alcohol. This is why you measure sugar concentration; the more sugars you have, the more alcohol you will end up with. Here it gets added, it is white before it gets stirred in. 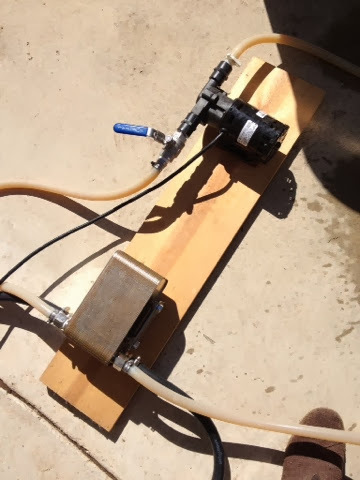 Next week, we will use the side tap to draw off a sample. 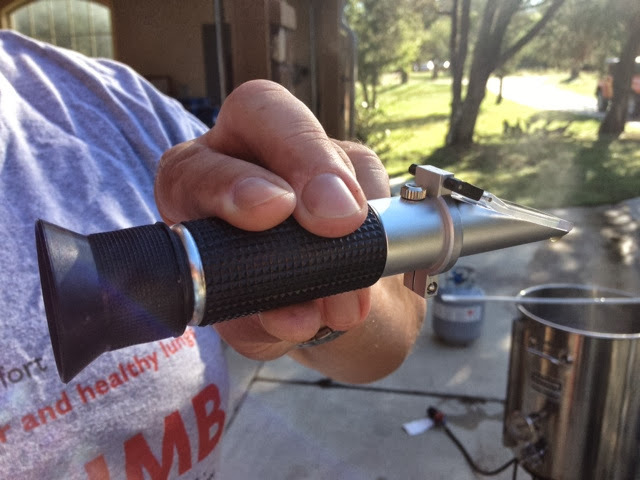 It will be sweet and cloudy at first, and over the next two weeks it will become less sweet and more clear as the yeast does its work, and the various proteins drop out of the beer. 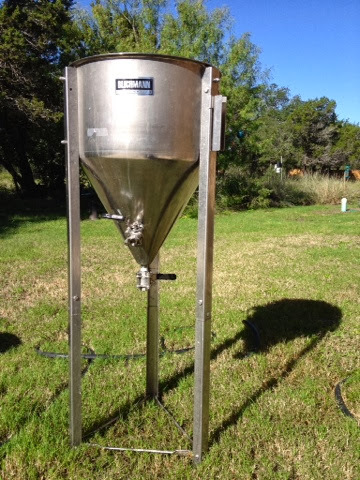 They collect at the bottom of the cone, leaving the side tap available to take clear beer from. 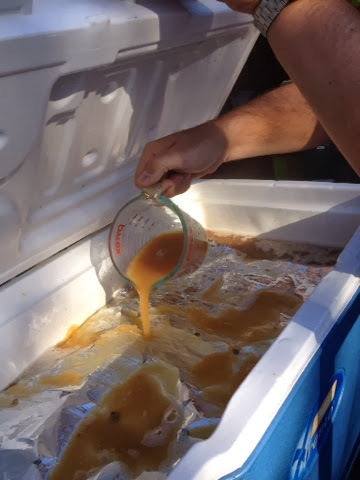 Three or four weeks after brewing, it should be ready to drink. At that point, we will transfer it into kegs and add some CO2 to carbonate it.